What a GREAT way to give a gift! 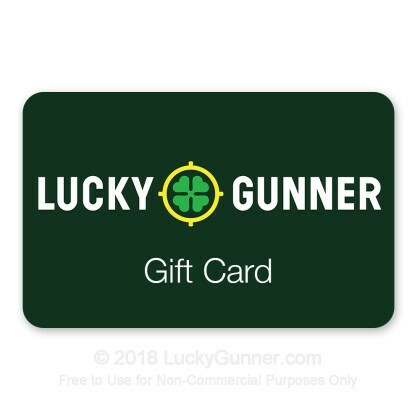 LuckyGunner.com gift cards are perfect gifts. Just add a gift card of the amount of your choice to your shopping cart and our staff will email you and/or your designated recipient a crisp, clean, and attractive looking gift card to print off! Each gift card displays a special coupon code that can be used when making a purchase on our website and each card can be used over and over again until the value of the gift card is completely spent. It gets even better. LuckyGunner.com gift cards are good for a full five years after the date of purchase! No matter what kind of ammunition your friend or loved one needs, this gift hits the spot. How cool is it to give a gift card for ammo!? Please note you will only receive an emailed Gift Card to print and no physical Gift Card is available to be mailed.